This type of solid milk glass decorated glass belonged to a line that Consolidated dubbed Con- Cora, deriving from the first few letters of the names Consolidated and Coraopolis, the town near Pittsburgh where Consolidated made glass. Milk glass became immensely popular after World War II. Almost every American glass company put out its version. Westmoreland, Imperial are the better known names associated with this glass. This line was Consolidated's entry into the crowded marketplace. 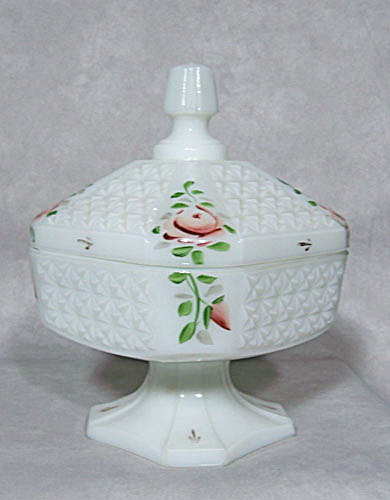 Dating from the 1957-1962, most Consolidated Con-Cora items were decorated in one of the three most popular lines: Ivy, Violet, and Rose. This piece is decorated in the pinks and dark greens of the #1510 Pink Roses. It measures 4 inches tall without the lid and 8 inches tall with the lid. At Consolidated, we know there were nine women decorators who hand-painted the decorations on these pieces. It is in excellent vintage shape. Enjoy America's glass past by purchasing a pratical and beautiful piece of American glass.